That’s it – you will be entered in the draw. One winner will be drawn at random from all the qualifying entrants on 6th May 2017 and the winner will be contacted to arrange for delivery of the prize. The prize draw is only open to UK residents. 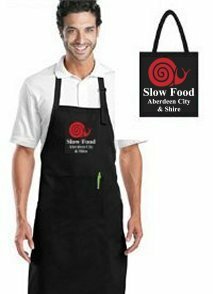 There is one prize of a Slow Food Aberdeen City & Shire branded apron plus a Slow Food Aberdeen City & Shire branded tote bag. There is no cash alternative.